1. Cook the rice. Prepare the Inari Age. Make Kinshi Tamago(shredded egg crepe). 2: Cut the eel into 3 slices. Cut the other 2 slices into 1cm size squares. 3: Mix together the cooked rice, sushi vinegar, white sesame seeds, and the 1cm square cut eel pieces. 4: Fill the above mixture into the Inari Age. 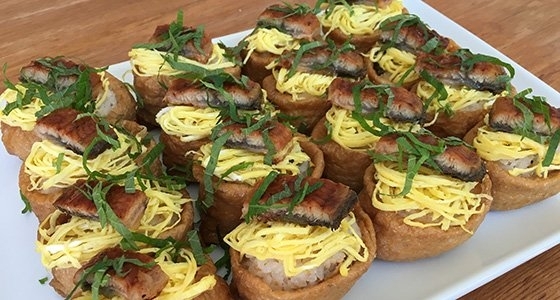 Place the Kinshi Tamago, the eel cut from the middle slice, and the sliced shiso leaves on top of the filled Inari Age.